If you want to truly live the Jeep lifestyle, there are some things you need besides your off roading Jeep. There are certain things you should keep in your Jeep so that you are prepared for whatever comes your way while you are off road. Whether you are considering a day trip or a camp out, these items could come in handy either for camping or in an emergency situation. Tent. If you are camping you will obviously need shelter. But you should keep a tent in your Jeep at all times, so that if you get stuck in the middle of no where you still have shelter. Don’t forget to also pack a tarp to put down under the tent, just in case it is muddy where you wind up camping. Water. You can never have enough water. Keep a flat of bottled water or several gallon jugs of water in your Jeep any time you plan on going off roading. If you get stuck, you’ll need that water, especially during the heat of the day, to stay hydrated. Basic first aid kit. This kit should have bandages, tape, gauze, disinfectant, and more. This is a must for any off roading trip no matter how long or short the trip may be. Other emergency items. You should always have a lighter in case you need to start a fire. A flashlight or head lamp is also important if you are out at night, whether you planned to be or not. A roll of duct tape and a long piece of rope could have many uses in an emergency, as could a swiss army knife or similar multi purpose tool. Food. If you are planning on camping, you are probably going to take food with you. But if you are going out for a day trip, you may not think about it. Having some extra food in your Jeep, even if it is just bread and peanut butter, is important. If you get stuck off road, you may need to have food readily available. Map. You should always have a map of the area you are off roading in, as well as a compass. This way you can find your way out if you were to get lost or turned around while off roading. CB radio or cell phone with great reception. Cell phone reception can fail, so it is always a good idea to have a CB radio any time you go off road. This way if there is an emergency, you can call for help. When most people get a Jeep 4×4 the first thing they want to do is modify it. They are in such a rush to make it look cool or to take it off roading that they often make some mistakes along the way. This usually comes from inexperience and a lack of knowledge. The best thing to do is learn about all the modifications and what they entail before you do anything. To help you out, here are the top five mistakes that are made by new Jeep owners that you should avoid. Making decisions too quickly is the number one mistake that people make. It is recommended that you wait six months to a year before doing any modifications to your Jeep. Consider after that amount of time what your primary use of the vehicle is. If it is off roading, then you can make modifications that are appropriate for that use. Getting in over your head. Make small modifications first. Do things that accessorize your vehicle rather than changing the way the vehicle performs. This includes small projects like adding a come along so you can get yourself out of sticky situations while off roading. These smaller modifications are much less expensive and will start you off on your path to modifications nicely. Not getting enough information before making Jeep modifications. You should get information from all types of people who have already been there. Ask people what modifications they made to their Jeep, and why they did it. This will give you some insight as to what modifications are appropriate. Sacrificing quality for cost is another major mistake. Many people want to make a lot of modifications at once, and they don’t really have the budget for it. So they cut costs and by doing so, cut quality. You want the best quality in your modifications if they are going to help your Jeep perform like you want it to. 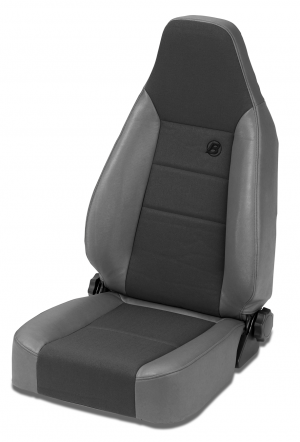 You also want the modification to be durable and not require a lot of maintenance. Finally, many people do not understand the full effects of making modifications to their vehicle. For example, putting a lift kit on your Jeep means that you must put bigger tires on your Jeep, which leads to gear issues that must be addressed with further modifications. Understand the full impact of what you want to do, and what modifications go hand in hand. 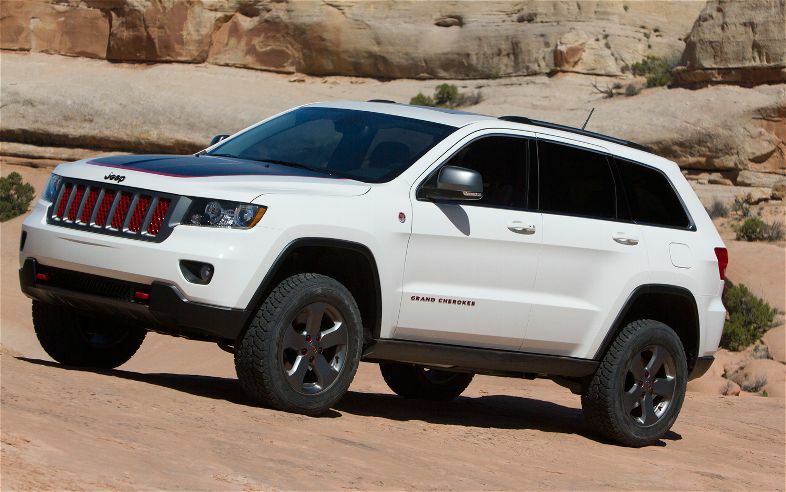 Over Easter weekend Jeep rolled out a new line-up of concept vehicles. The new vehicles were announced earlier in the year, but had not been seen until the Moab event in April. From all accounts the crowd was very pleased with what they saw. Below is a breakdown of some of the new concepts. According to the Jeep designers the Trailhawk concept is a way for them to provide a visual punch to the new line-up. This vehicle will be dressed up in some fun colors including: Stone White, Mineral Grey and Red. All the colors will get a matte black hood appliqué that is said to cut down glare. This new concept gets topped off with 18” Goodyear SilentArmor off-road tires. 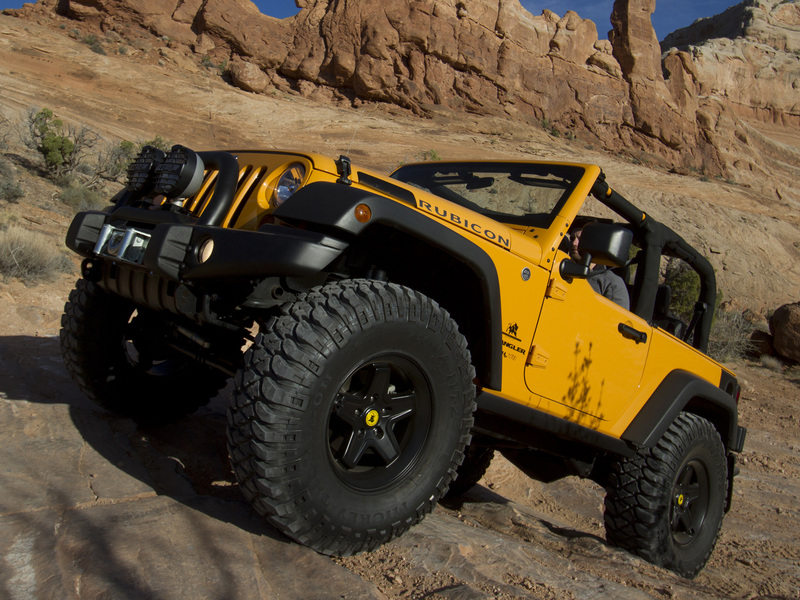 Chrysler says that this concept was designed for “Moab’s toughest trails,” and is a spin-off of the Dozer Yellow 2012 Jeep Wrangler Rubicon. Under the hood of this new powerhouse lays a bolted-in 470-horsepwoer 6.4-liter Hemi V8. This super engine is linked to a Getrag 238 six-speed manual transmission. 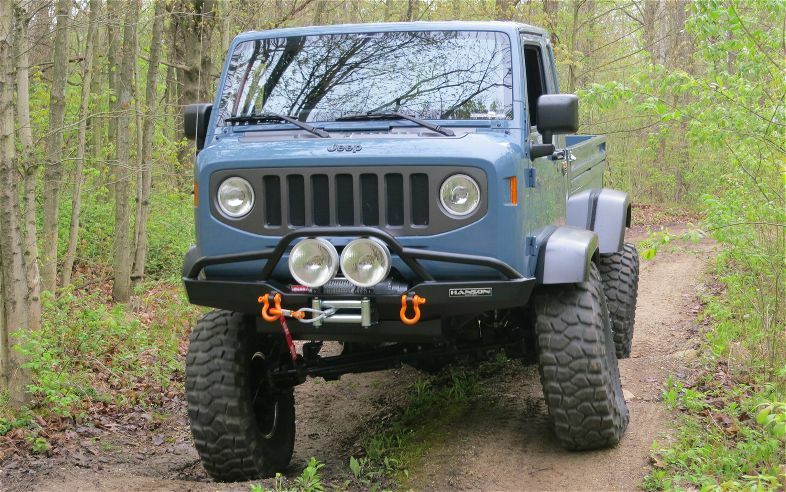 The Traildozer comes with premium Mopar front and rear bumpers, a 9.5 CTI winch and a factory-lifted suspension. The Wrangler Apache was made to appease the crowd who kept screaming for a V8-powered Hemi under the hood of a Jeep Wrangler. 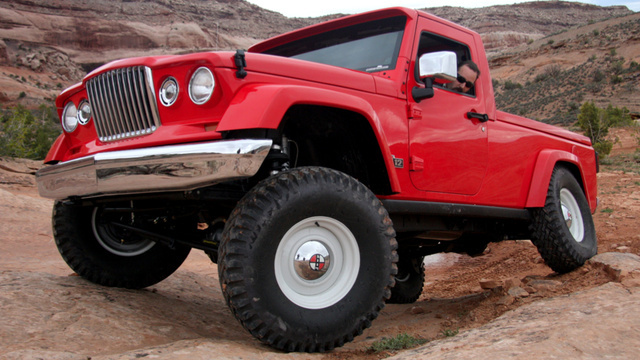 This vehicle features a brand new Mopar 470-horsepwoer 6.4-litre Hemi V8 conversion kit made for the Wrangler. It will hit the streets in the summer of 2012 with a 5-speed automatic transmission, but there will be a 6-speed manual to follow. Designers used a 2012 Wrangler Rubicon as a base for this vehicle that is said to be a nod to fans of the Jeep Forward Control which hit the streets in 1956. The cabin has been moved over and in-front of the front axle. The wheelbase has been stretched and they have also added a custom drop-side cargo box. The FC Concept comes with Hanson bumpers, a Warn 16.5 winch, a stainless steel exhaust system from Corsa, and King coil-over reservoir shocks.